She was born in Čačak in 1873 and died in Valjevo in 1915. She moved to Belgrade with her family in 1884. She graduated from the Women’s College in Belgrade in 1891. In the following year she passed her examination for a drawing teacher in secondary schools and became a student in the studio of the painter Djordje Krstić. She attended classes in the private art school of Kirilo Kutlik in 1896/97. In 1898 she started her art education in the studio of Slovenian painter Anton Ažbe in Munich. 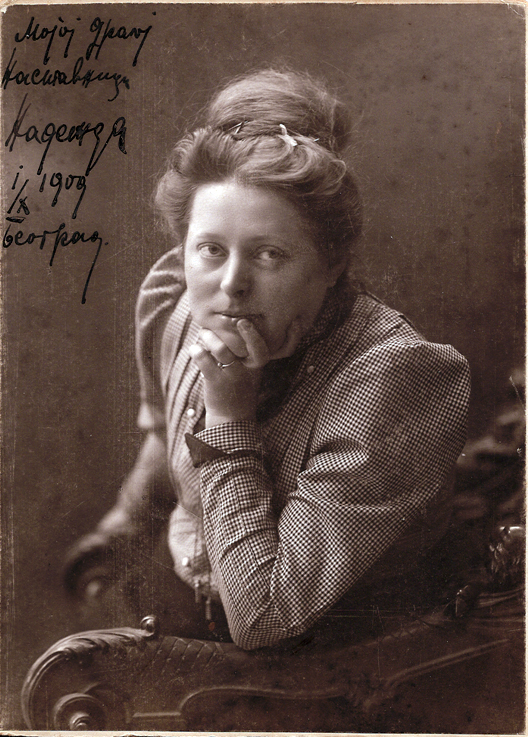 Already in 1900 her first solo exhibition of paintings was held in Belgrade. In 1901 she started working in the studio of Julius Exter in Munich. After 1904 she worked in her country on the organisation of the First Yugoslav Art Exhibition and on the foundation of Lada Art Association and the First Yugoslav Art Colony (Sićevo, Pirot 1905). By 1912 she exhibited her works at numerous exhibitions: Lada Exhibition in 1906, The Yugoslav Art Colony Exhibition in 1907, Serbian Art Association Exhibition in 1908, the second solo exhibition in Ljubljana in 1910, in the same year in Paris at the Autumn Salon and in Zagreb with Medulić Art Group. In the following year she exhibited her works in the Serbian Pavilion at the World Exhibition in Rome, the International Union Exhibition and the Autumn Salon in Paris. In 1912 she opened her own school for painters in Belgrade and took part in the Fourth Yugoslav Art Exhibition. In the First Balkan War she was a voluntary nurse at the front. She was again with Serbian soldiers in 1913/14. She died in Valjevo, infected by typhus, being on duty as a voluntary nurse in 1915. The fine art of Nadežda Petrović, our most important artist from the beginning of the century, introduces Serbian art in the courses of contemporary European art. Owing to her spirit which from small Serbia longed for modern world and thanks to favorable circumstances that she could go to school and visit fine art centers of Europe at the beginning of 20th century, her painting mostly kept up with European expressionism, impressionism, fovism and sometimes it was close to, still not famous, abstraction. In her best works of art large areas dominate as well as her favourite bright reds and complementary green. A love for colours creates a coloration whirlpool where, apart from others, fovistic violet, blue and black are emphasized. Strong strokes of the brush, wide and thick paste applications sometimes change the canvas into a dynamic relief surface. She liked to paint portraits and landscapes, and her patriotism could be seen in a frequent choice of subject from the national history and in picturing people and regions of Serbia.